This is rather a sad issue for us here at Silver Age Books. For one thing, we’d hoped for many, many years that with issue 32 we would finally catch up with McSweeney’s Quarterly Concern – in terms of issue numbers if nothing else. It was a silly, arbitrary goal, but one that kept us going through the long Sundays of proofreading. But it wasn’t to be: we’ve produced this issue a bit late, and those literary rascals at McSweeney’s managed to sneak out an issue 33 just as the year turned. We could console ourselves with the thought that Hamish Hamilton have yet to release issue 33 in the UK, but it feels hollow. Blast the erudite, beautiful hide of Dave Eggers and all who work in his dungeons! The second reason for our sadness affects the reader more directly. In this issue concludes the saga of Newton Braddell, a virtual ever-present in this magazine since his first appearance in issue 8, back in 2005. “The ship drifted like a wind-tossed seed through the long night of space.” Thus it began, and Newton never really achieved much more control over his life than was thus established. Yet his endless adventures have endlessly entertained this editor – and sustained the magazine! 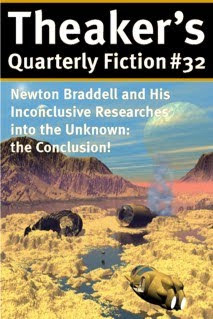 I have always known that should no other suitable contributions be received, there would always be at the very least a Newton Braddell episode to publish. Herein we have the final four episodes: the magazine will be forever lessened. But new adventures ever beckon! On one hand, in the style of British comics of old, this issue features on its flipside one of the final issues of Pantechnicon, a fellow zine that ran out of steam. Though I am of course always glad to see our rivals tumble to their doom, I was more than happy to help them get their last issues out to the world. Also, I was recently lucky enough to be appointed the caretaker chair of the British Fantasy Society… It’s a huge honour, but it does mean that this year’s issues of TQF will probably be a bit shorter than usual (like this one), so that I can do my best to stay on top of everything. Our schedule may be a little more erratic than usual. As my favourite typo has it, bare with us! This issue's cover is by Howard Watts, an artist from Brighton who has previously supplied covers for Pantechnicon and Theaker's Quarterly. There are just two reviews in this issue, both of Doctor Who audio adventures from Big Finish: Patient Zero and Paper Cuts. You can get the two parts of this issue free from us from here (TQF) and here (Pantechnicon). Paper copies of the two, arranged as a fancy flipbook, are available to purchase from Lulu. They are also available from Feedbooks for free download in various formats to read on your Kindle, Sony Reader, Nook, iPad etc, and even in a simplified pdf that might be handy for anyone reading the issue onscreen.